Finding roofer leads can be challenging, especially if youâ€™re taking a more old school approach. We totally get it. Itâ€™s a hands-on job, so youâ€™re more used to a manual approach when finding new customers. Getting your digital marketing approach is probably the best way you can generate hundreds of new leads every month - and you donâ€™t have to leave the comfort of your office to do it. Sometimes youâ€™ve gotta sit back and really take a look at all the awesome online tools you have at your disposal. Letâ€™s face it. You canâ€™t spend all day driving around, looking at all the roofs in your local neighbourhood, banging on doors if you see one that needs repair. Itâ€™s just not a viable way to do business. You donâ€™t have the time for it. And itâ€™s a little creepy. And weâ€™re sharing those ways with you right here. If you can harness the power of all three of these, good for you. If you can only manage 1 or two, and do them frequently, youâ€™ll be a-okay. Thatâ€™s not all there is to it. There are some other fantastic content ideas you can focus on thatâ€™ll generate mega traffic. All you really need to do is make the right decisions. Now, weâ€™re not suggesting that you release a new book every month. In fact, weâ€™re not even suggesting that you release a new book every quarter. You might get away with one every couple of years. Just consider getting one out there. Maybe two. For now. Books and eBooks keep your current audience topped off with fresh content. They also leverage your lead generation power on startup-focused sites, like ProductHunt. Seriously, enough upvotes will keep you going for a long time. Launch your books on external communities where your audiences spend their time online. Use them for lead generation throughout your blog. Wherever you can, include regular calls-to-action, asking readers to go and download your book, especially in high-trafficked blog posts. When you reached this section in our blog post, your first instinct was probably to wave it away. After all, you donâ€™t have the time for all that writing, anyway. First, consider which blog posts have had the biggest impact on your audience. Or, consider which topic has the greatest demand. Next, go through your existing blog posts on the topic and organize them into a simple Google Doc. Check to see if you have any information gaps. At the same time, check for redundancy issues and remove any duplicate content within this draft of your new book. Once youâ€™re sure that youâ€™ve covered all the points you need to, do a thorough edit of your extremely long doc. Primp and fluff where necessary, make sure there are no grammar issues or typos, and slap in a table of content. If your text passes the QC, design a simple (yet eye-catching cover) on a tool like Canva. Donâ€™t underestimate the power of a cut-and-paste template. People generally donâ€™t have the time to waffle on for hours, creating their own emails, worksheets, datasheets, questionnaires, social media posts, and so on. Especially when it comes to learning a new business writing skill, people want as much guidance as possible. They want to know that they have a good starting point without having to worry about setting everything up themselves. Our cold email templates, for example, have helped hundreds of customers set up successful email campaigns. Our customers love â€˜em and we love handing them out. Itâ€™s all about having the smarts to develop a useful document that is straightforward, easy to use, and involves nothing more than a quick copy-paste with adjusting of minimal content. Online learning is booming right now. People hanker after knowledge like never before. Everyone wants to develop new skillsets. Very few people want (or can afford) to pay for the extra tuition fees. Thereâ€™s a distinct need for quality instruction on a wide range of business and tech-related subjects. Just take a quick look through any online learning portal and youâ€™ll see topics that range from something like email writing all the way through to in-depth online marketing courses. Youâ€™ll even come across stuff like speech writing and delivery, impromptu speaking, how to run a successful webinar, and so much more. Youâ€™re guaranteed to have at least one â€œmarketableâ€� skill that you could develop a course on. Take some time to mull it over and then get started. You donâ€™t even have to go through the schlep of designing the coursework. A ton of online teaching platforms are ready and waiting for you. With an easy setup and hosting process, and step-by-step course instruction forms, youâ€™ll be ready to start spreading valuable knowledge in no time at all. Most of these teaching platforms are completely template-based, making the setup process that much easier. You probably have a rough idea of what your audience might be looking for. If this isnâ€™t the case, you simply need to get to know your audience. How to create Facebook ad campaigns that really work. How to promote blog content effectively. How to become a contributor on reputable sites, like Forbes. How to build relationships pitch content ideas to editors. As long as you come up with ideas that will actively solve a problem your audience needs to solve, youâ€™ll have enough ammunition for an extremely popular online course. Make sure you give them enough of a foundation to get started with the work themselves but make it clear that youâ€™ll be right there if they decide that the burden is too much to bear. Your courses need to show that youâ€™re the ultimate benevolent teacher. You should always be happy to share your valuable knowledge with no strings attached. Often, youâ€™ll find that people will give things a bash but end up discovering that they simply donâ€™t have the time to add anything else to an already lengthy to-do list. 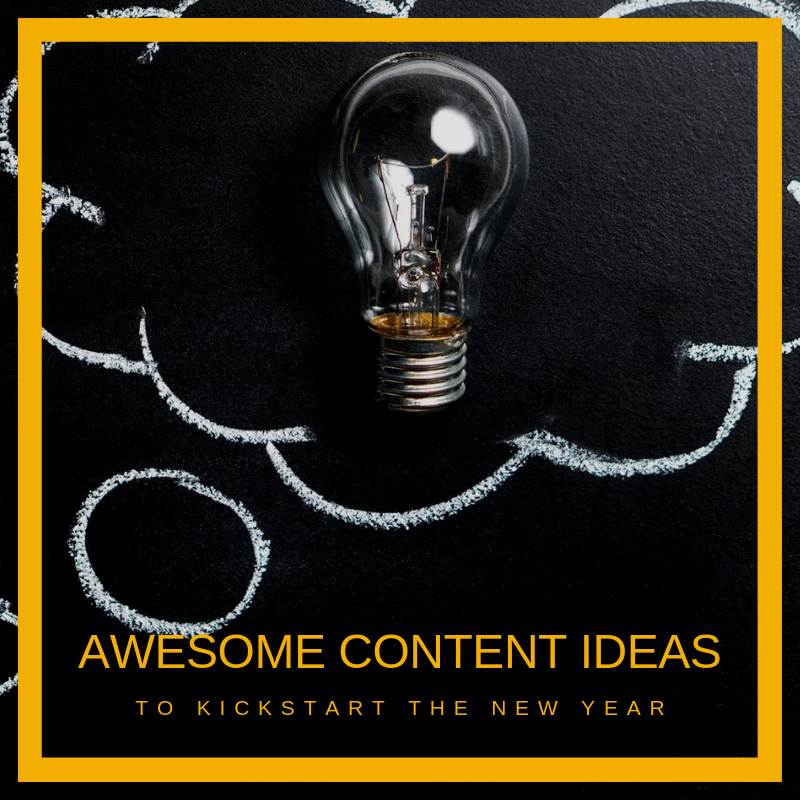 Weâ€™ve got one more blog post in this series coming up, so stick around for another set of fantastic content ideas for your lead generation tactics.